Happy Father’s Day weekend! Today I wanted to show you a recipe for Chocolate Chip Cookie Cake. I thought it very fitting for this special weekend, because what “Dad” doesn’t like cookie cake? My family is notorious for making cookies. You can probably find 20 different cookie recipes on my blog! 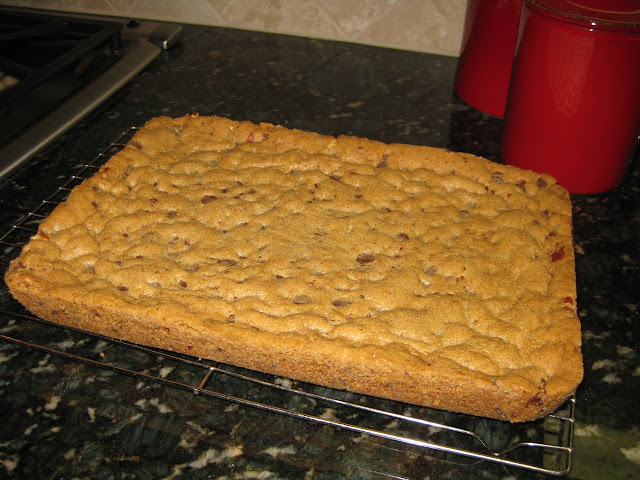 In the back of my mind, I’ve always wondered how to bake a cookie cake without it getting too crispy or overdone? I like my cookies gooey and soft, and always err on the side of underdone. In Flo Braker’s cookbook, Baking For All Occasions, my mom discovered this cookie cake recipe and we were curious to try it. The batter is like any regular cookie dough batter. The only difference is the baking time. Instead of baking cookies for 10 minutes in a 350 degree F oven, this cookie cake is baked for 30 to 40 minutes. Honestly, I don’t know why you couldn’t transform your favorite cookie dough batter into a cookie cake? Someone test it out and let me know! I know a lot of people who hate “cake”, but love cookies. I’m not a big fan of the “cake” myself…the only reason I eat it is for the icing! Here, you can have the best of both worlds…cake and icing! Decorate your cookie cake for Father’s Day, Birthdays, Congratulations, or just leave it plain like we did. Either way, enjoy this Chocolate Chip Cookie Cake. 1. Center a rack in the oven and preheat to 350 degrees F. Butter a 9 x 13-inch pan and set aside. 2. In a stand mixer fitted with a paddle attachment, combine the flours, sugars, salt, cinnamon (if using), and baking soda and mix on the lowest speed until just blended. Add the butter and continue to mix until small, moist crumbs form that look similar to streusel, about 1 minute. Add the egg and vanilla and beat on low speed until the mixture begins to form a cohesive dough. Increase the speed to medium and add the chocolate chips and nuts. Beat just until they are incorporated, 20 to 30 seconds. 3. 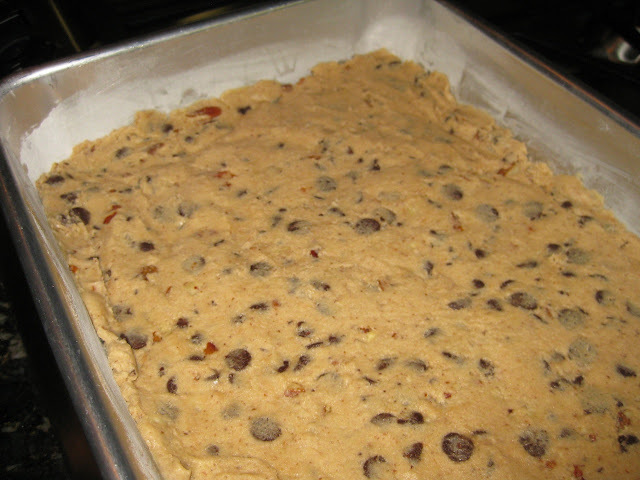 Spoon dollops of the thick dough evenly over the bottom of the baking pan with a rubber spatula. To distribute the dough evenly, lay a sheet of plastic wrap or parchment paper over the dough and pat it evenly with your fingertips. 4. Bake the cake until it is golden brown and feels more solid than soft when pressed in the center, 30-40 minutes. Be careful not to overbake, it will firm as it cools. Transfer to a wire rack and let cool in the pan for 30-35 minutes. 5. Slip a thin metal spatula between the cake and the pan and run the spatula along the entire perimeter of the pan. Lift the pan, tilt it slightly, and tap it on a counter to help release the cake. Invert the cake onto a wire rack and lift it out of the pan. Invert so it is right side up and let cool completely. One Response to "Chocolate Chip Cookie Cake"